The chances of you catering for that client again is very slim. Another thing is at your restaurant, you have all of the products and items that you need. On a catering you need to make sure you have everything that you need. It is very important to pre-plan! One of the very best methods of pre-planning is having an effective catering setup checklist. You have to remember that a catering setup checklist only works if you use it correctly. We use a highlighter to mark off the items we take, only after they are loaded! The reason we use a highlighter is you can still see what the item was, if you use a marker or pen there is a good chance you will not be able to read what was on the initial list. This could be important if you are missing an item or if you have to backtrack for any reason. We only mark those items off when they get loaded into our catering vehicle. 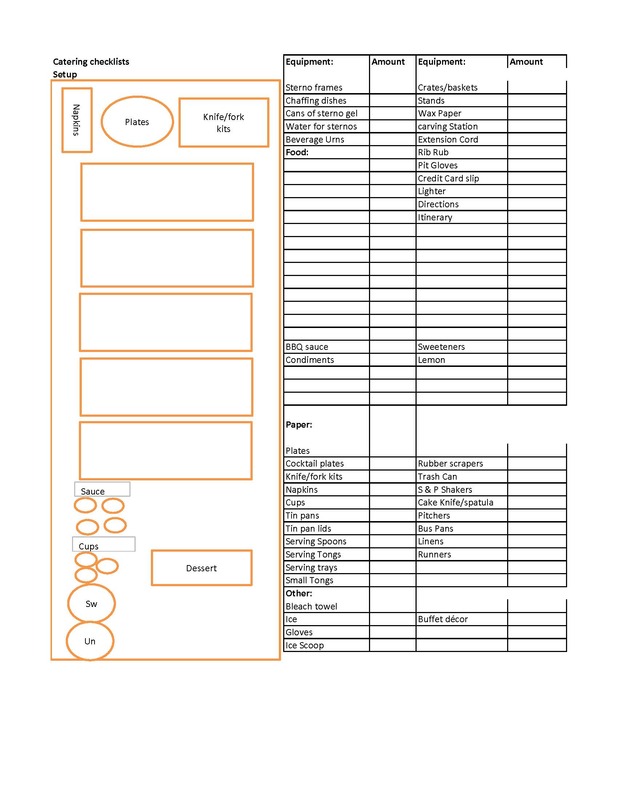 What Are The Contents of a Catering Setup Checklist? 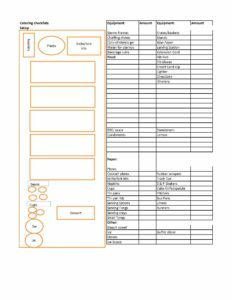 The catering setup checklist that we use is a complete overview of all of the equipment and food quantities that we are taking. Take a look at our catering setup checklist. You can make your catering setup checklist custom to the products and items that you use. By looking at ours you can see that there are items written in the spaces as well as blank spaces. The written in items are items that we frequently use on almost every catering. The blank spaces are for additional items that are needed. If you notice on the left of the checklist, there is a buffet setup illustration. This illustration is a great starting point. Each box in the illustration without writing is considered to be a chafing frame (cold or hot). We write in the foods and the order they will be arranged in. Usually we like to put our foods in order of cost, less expensive to most expensive. Breads tend to be first, then the not as popular or cold side items, then the hot side items, and lastly the proteins. Once the foods are written in, we add those items into the spaces on the right under the “Food:” heading and the amounts of those items. Lets go back to the illustration. Now that the menu items are listed, you have a count of the amount of chafing frames that are needed. You would write that amount over on the right side of the sheet under the “Equipment:” heading. From there you can determine the amount of canned heats needed (sterno gel) as well as the amount of water needed for the chafing frames. Also, by looking at the illustration you determine the amount of serving utensils needed for this catering. **Quick Tip** : Keep in mind the burn time on the canned heats, you may need to add additional heats if you’re serving time exceeds the life of those canned heats. Another factor to consider is that you can speed up the burn time is if it is an outdoor event and it is a windy day. If the wind does not blow out your canned heats it can definitely cause the gel to burn up quicker. **Quick Tip** : If you plan to make your buffet a double sided serving line to be more efficient, make sure to double up on your serving utensils. When filling out your catering setup checklist be sure to use your invoice to help fill it out. Also use or have a food production report. Our catering software does this for us. This food production report will give you the amounts of the food items that you need to bring. Knowing those amounts helps you figure the amount of equipment needed as well. As you fill out your checklist be sure to think out and around each of those items. 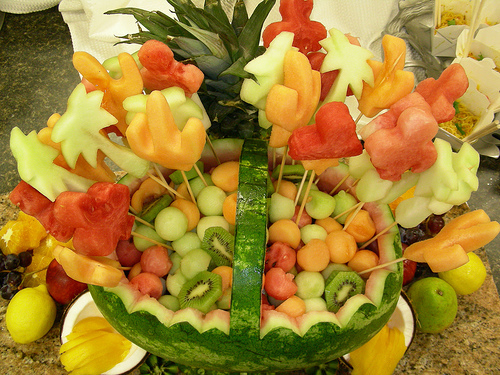 For example, on many wedding caterings that we do we often provide a fresh fruit, assorted cheese, & cracker display. Sounds simple but there are many components that we have to bring to put this together. For the fruit we bring watermelon, strawberries, grapes, and pineapple. We bring cheddar, Swiss, and Monterey jack cheese cubes. Also, we bring the assorted crackers. Those are just the food items that make up this display. Now we need to add the equipment items. This includes two 3-tiered stands and a granite slab. Since this is a self serve display we need to bring multiple small tongs (we usually bring 4), wax paper, cocktail napkins, and cocktail plates. All of these items need to be on the checklist! This is just one item off of the menu. So be sure to think about the components needed for every item. When you fill out your catering setup checklist, you do not want to rush. This is the time to be thorough and accurate. By doing this right you save yourself time in the long run of the catering. I call the catering setup checklist the “Treasure Map to Success”, when you and your staff follow the map it will take you to the treasure of catering success! The catering checklist also streamlines the items needed to pack. The preparation prevents you from taking too many items that you have to sort through and figure out if you are going to use them or not. I can’t emphasize just how important pre-planning and filling out checklist are! They are crucial to executing and the success of your catering. It is very important to have a catering setup checklist! Take the time needed to be thorough and fill it out as precisely and accurate as you can. Other than your pre-planning for your catering, be sure to include itineraries, directions, notes, and anything else that will insure the successful outcome to your catering! Feel free to download this checklist and make it your own. Let me know if you have any questions in the comments below! Very detailed post on the catering business. I used to run a contract manufacturing electronics business. I know how one simple mistake could ruin the whole production, in this case your catering on the functions itself. A checklist is helpful but we need the person who’s filling it adequately trained. Creating and implementing a SOP would be vital in avoiding costly mistakes.. Thank you so much Kenny for your comments!! Checklist can be very valuable, but your right!…the person making the checklist has to be trained or else that checklist isn’t effective. Thanks again for the comment & feedback! 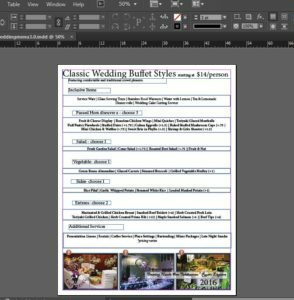 Hello, Chris, your Free Catering checklist article is more a help to me because with this I can take care of all those mistakes that cost me a plate of food, lol. But seriously, you have in a professional manner analyzed every angle showing that you know what you are talking about and you are in the catering services too. I can only imagine how many people that would see this article as a goldmine. Thank you for this information and keep on doing what you do because it is being appreciated. Nnamdi, ~ Thank you so much for commenting and for your awesome words!! I appreciate it. Previous Previous post: Marketing Strategy for Restaurant, The Only One You Need! 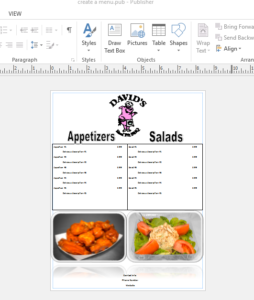 Next Next post: Two Wedding Catering Menu Templates, For FREE!